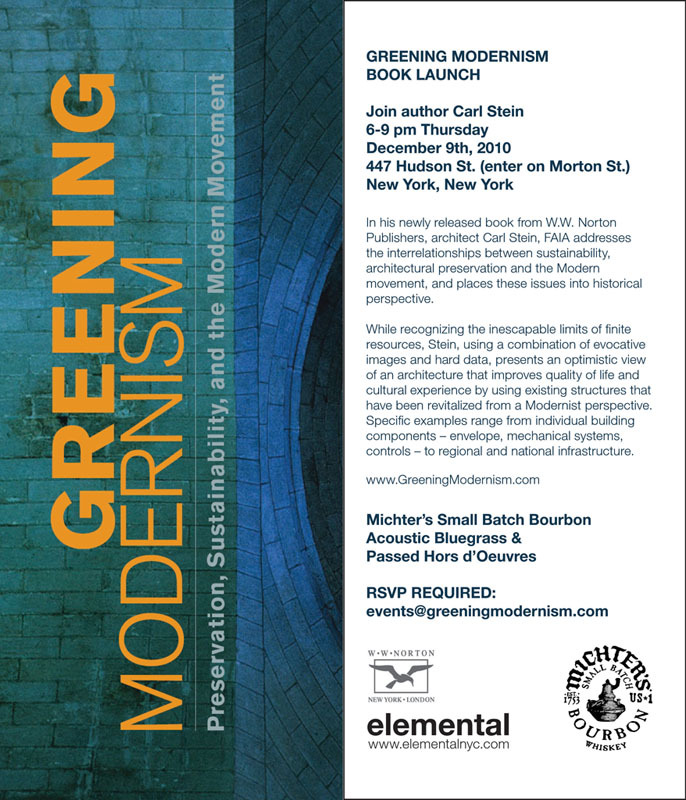 Carl Stein’s New Book, Greening Modernism: Preservation, Sustainability, and the Modern Movement, raises discussion about the connection between sustainable practices and modern architecture. Through addressing the environmental impacts of building decisions, the author argues the inherent sustainability in Modernist design. Focusing upon the importance of preserving and reusing historical buildings as a key sustainability strategy, Greening Modernism serves as a resource for architects, engineers, urban planners, as well as environmentalists. To support his case, Stein provides quantitative data to support the reintegration of modernist strategies, through reducing our dependency on finite resources, such as petroleum. The book rings clear with the sentiment that through understanding the environmental importance of their decisions, architects can continue their practice while doing their part to save the planet. Bodacious bourbon pours complimented savory vittles at the yet-to-be-opened Hudson Clearwater in Greenwich Village last night. 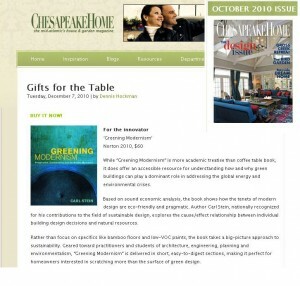 The restaurant’s first event launched Carl Stein’s new book, Greening Modernism: preservation, sustainability and the modern movement (W.W. Norton, $60.00). The affair had a decidedly down to earth flavor, though the elegant crowd resembled intermission at The Met. The venue seemed a natural fit for Stein of Elemental Architecture, since Elemental’s John Barboni designed the space using salvaged material culled from the 180-year-old carriage house. 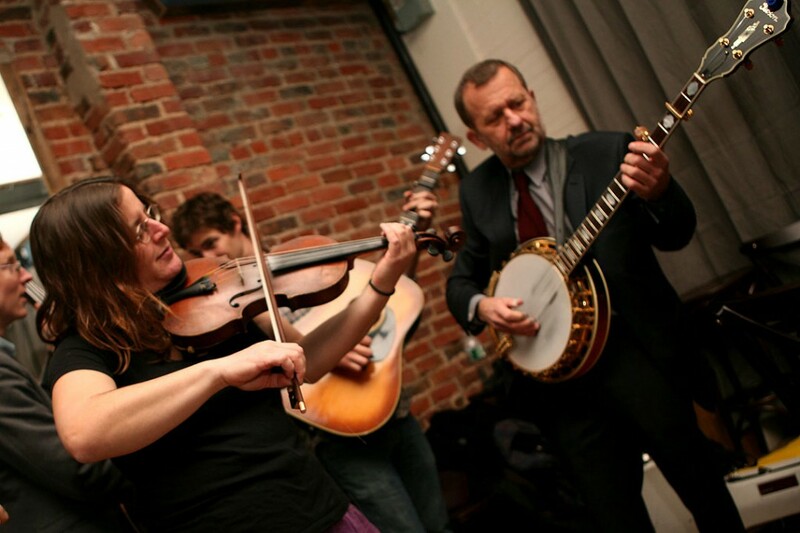 From atop a small flight of stairs Stein thanked his family and colleagues, then settled in with the band to play banjo. 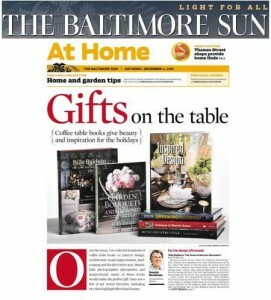 New house and garden design books make the perfect holiday gift. 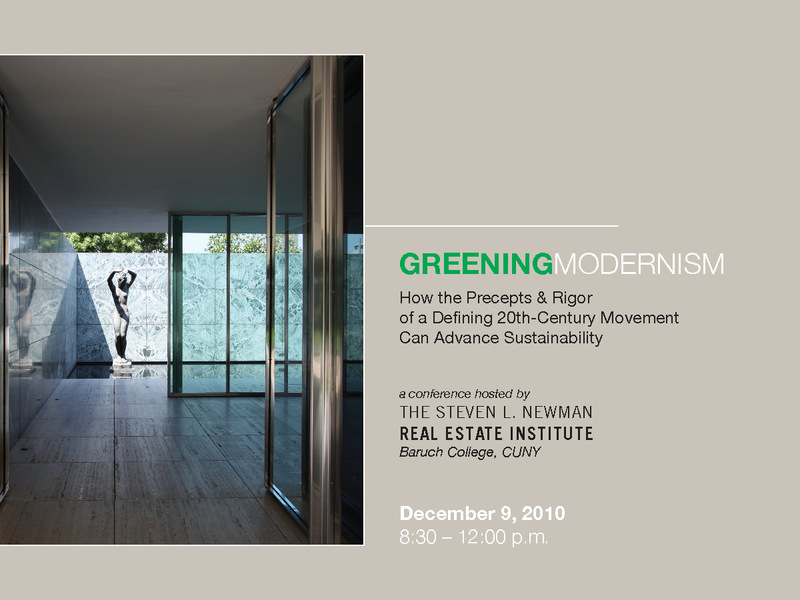 While “Greening Modernism” is more academic treatise than coffee table book, it does offer an accessible resource for understanding how and why green buildings can play a dominant role in addressing the global energy and environmental crises. Based on sound economic analysis, the book shows how the tenets of modern design are eco-friendly and pragmatic. Author Carl Stein, nationally recognized for his contributions to the field of sustainable design, explores the cause/effect relationship between individual building design decisions and natural resources. Rather than focus on specifics like bamboo floors and low-VOC paints, the book takes a big-picture approach to sustainability. 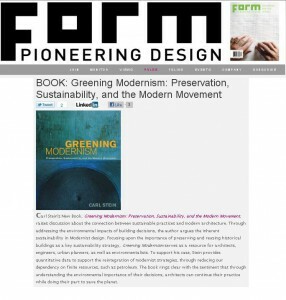 Geared toward practitioners and students of architecture, engineering, planning and environmentalism, “Greening Modernism” is delivered in short, easy-to-digest sections, making it perfect for homeowners interested in scratching more than the surface of green design. 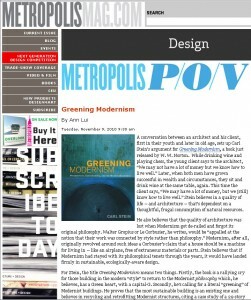 Greening Modernism reviewed by Ann Lui for Metropolis Magazine. 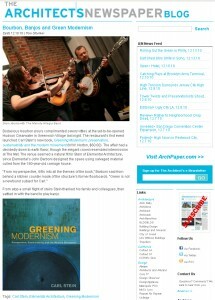 An in-depth interview with author Carl Stein and review of Greening Modernism on Architects + Artisans. 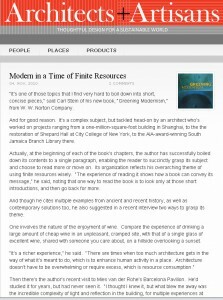 Also, see the slide-show of images from the book. “It’s one of those topics that I find very hard to boil down into short, concise pieces,” said Carl Stein of his new book, “Greening Modernism,” from W. W. Norton Company.